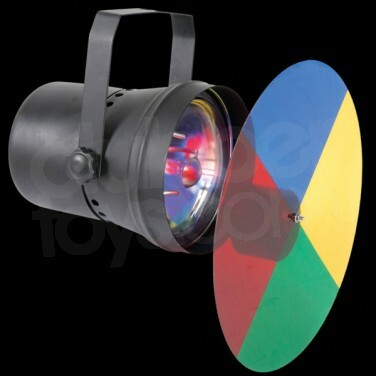 Get super colourful lighting effects from the easy to install PAR36 Spotlight and Colour Wheel. Fabulous professional disco lighting that's so easy, you can use it at home too! A bright and colourful disco light that's guaranteed to make a big impression on your dancefloor, the PAR36 Spotlight and Colour Wheel includes a four colour wheel featuring red, blue, yellow and green that rotates at 2.5rpm for super colourful effects! Brilliant when used with a mirrorball, a bulb is included and the mains lead and plug are fitted so that all you need to do is plug it in and place it to really get your party started!